When it comes to the success and reputation of your business, no detail should be overlooked or ignored. For companies that work with heavy-duty equipment or machinery that relies on hydraulic power, custom hydraulic hose services are essential. Whether you have odd-sized, hard-to-find American hose and hydraulic safety issues to consider or if you use custom hydraulic hoses to improve performance in extreme conditions, Metro Industrial & Marine Supply can help you to achieve your goals. Companies that use our hydraulic hose shop in Fall River have the peace of mind that comes from knowing that they have the best possible materials available to protect their machinery, employees, and business from catastrophic hydraulic failure. The goal of custom hydraulic hose services is to provide operators with the best possible methods and tools to maximize the abilities of their hydraulic equipment. The correct hose length, inner dimension (ID) lines, and hose flexing abilities must all be taken into consideration. Lines that have an ID that is too large won’t be able to bend and maneuver in tight spaces. Smaller lines can be routed much easier, keeping lines neater and more organized throughout use. The correct hose length is essential. If the hose is too long, it will be difficult to get the pressure required to operate the equipment efficiently. This is why you need to know the proper length when you visit a hydraulic hose shop in Fall River so that you can get the best possible results. When it comes to the flexibility of a hose, it is crucial to know that custom hydraulic hoses are designed to flex or bend, not twist. Hoses that are twisted will not perform effectively and are more prone to failure. A seemingly simple 7 percent twist on a high-pressure hose can reduce its service life by as much as 90 percent. That doesn’t just mean more frequent replacements for custom hydraulic hose services, but also more chance of failure, which could result in injury to the operator, employees, and job site visitors, damage to machinery, and costly downtime during cleanup. A high-pressure hose should be routed to flex or bend in just one plane to provide optimal results and prevent damage to the hydraulic hose assembly during use. 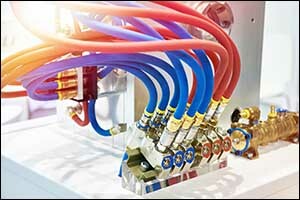 For best results with American hose and hydraulic safety, if a hose must flex or bend, it should be routed through the pivot point around which the component is moving. This is by far the most efficient and safe method for flexing of the hose line, using the least amount of hose, and keeping the hose within the contour of the machine. This technique also helps to ensure that the hose flexes like a hinge. If the bend is not hinge-like and efficient in manner, it could bend in an S-shape, which would result in excessive hose movement, increased wear and tear, and overall reduced service life. See the owner’s manual or contact the manufacturer if you are having difficulty in achieving proper hose flexing with your equipment. Reciprocating motion and rotary motion are two other types of movements that can be advantageous to custom hydraulic hoses. The ends of the hose can reciprocate through the use of hose reels, festooning, or rolling, depending on your needs. Custom hydraulic hose services are often required if a reciprocating motion is necessary for the hydraulic hose assembly to be installed correctly. The same goes with a rotary motion, which is achieved through the use of swivel or rotary joints to provide a rotating motion. When rotary movement is at a continuous 360-degree motion, use a rotary joint. For reversing movement, a swivel joint is the best choice to prevent the hose from bending or twisting at the fitting. We specialize in custom hydraulic hoses at Metro Industrial & Marine Supply. Our team of technicians has the capabilities necessary to create custom made-to-order hoses unlike any other supplier in the local area. Our team can offer up to 2″ 1-6 wire hydraulic loses, depending on the needs and requirements of our customers. We go above and beyond to ensure that we provide our customers with the best possible solutions for American hose and hydraulic safety in the Southcoast area. We also offer services nationwide and internationally via our website. Our same-day service is available for most of our custom hoses, and some of our customers take advantage of our while-you-wait services. At Metro Industrial & Marine Supply in New Bedford, MA we also retain a large selection of foreign adapters in stock, in addition to our American hose assembly options. We have US, metric, British, and JIS adapters, depending on the needs of our customers. Whether you need industrial or hydraulic hose couplings and adapters for heavy-duty equipment, industrial machinery, or hose for air, water, oil suction, or discharge, you can count on Metro Industrial to have everything you need to get the job done right. Choose custom hydraulic hose services for hydraulic hose assemblies ranging from 1/4 ” ID to 2″ ID, four-spiral, ultra-high pressure, low pressure, crimp fittings, steel, brass, and stainless steel, plus all of the US and metric ends you could ever need. Give us a call at 508-996-8400 or stop by our location on Coggeshall Street in New Bedford, MA during office hours. We also carry a wide selection of industrial supply products, including batteries and chargers, bearings, cam locks, compressors, gasket material, gauges, safety gear, industrial belts, lubricators, motors, oil, pneumatic products, and much more.